First of all welcome to my lovely new followers, I am so pleased you decided to join my inky journey, you are most welcome here. For those of you looking for the Allsorts Blog Hop, please click here. Well what I can I say because about the weekend, wasn't it wonderful weather here in the UK ? Two Bank holidays on the trot now has to be some kind of record, needless to say the promised rain has arrived this morning but it's a softer blow after three nice days. I will be quick and to the point and give you a quick reminder that Sarah and Vicky will be the screen at 2pm today on Create and Craft with a new Stamp Addicts show and here are a couple more of the samples I made for the programme. Have a good week everyone and will catch up with you all very shortly. 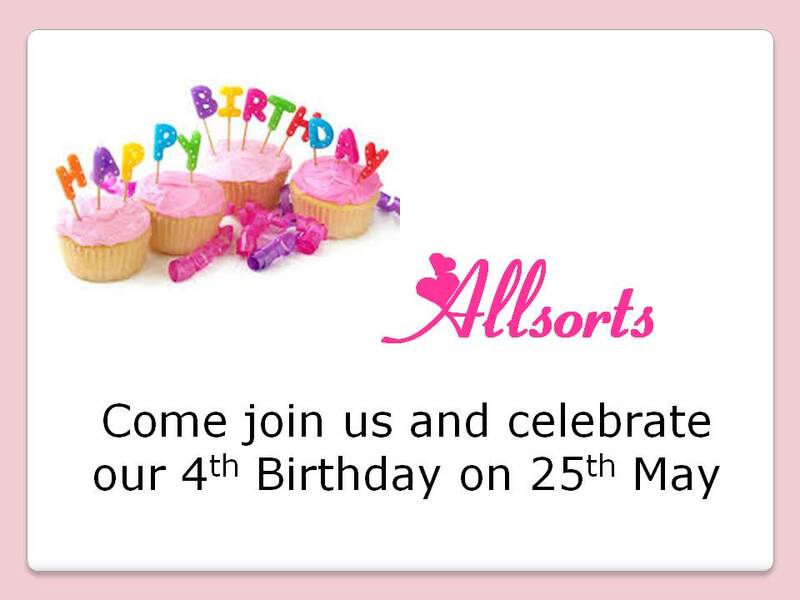 Well it's arrived, our fourth Birthday at Allsorts and it's frightening how quickly that time has passed by.........my Gran always used to say the years go quicker once you pass twenty one and being a good few past that now I have to say she is probably right. 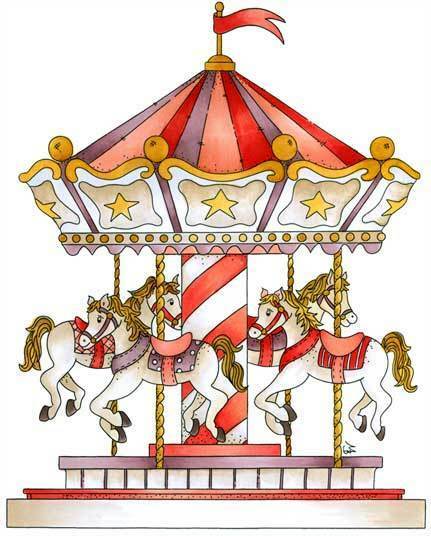 So in time-honoured tradition we are having a blog hop plus are lots of prizes to be won this week from our sponsors who are: PPR Crafts, Crimson Cloud, Digi Darla, Pin and Tack, A Passion for Stamps, Stix2 and Pretty Little Ribbons. They could only be one theme this week really which is Happy Birthday and for my card I used Spellbinder dies, Pick of the Bunch Peruvian Lily Stamp and Punch set, Memory Box leaves and the embossing folder which came with my e.Bosser........... yes I succumbed to one in the end and am finding it a great piece of kit. 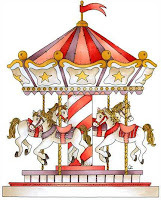 On your blog hop journey you should have arrived here from Tracy's blog and go next to Tracy Mouses's blog, but should you get lost along the way you can always go back to the challenge blog and start again. I will be selecting a winner from all the people who call in on me this week and leave a comment and here's the prize for that person. The letter you need to collect from me is hopefully pretty evident in this post so have fun hopping and wishing you all a lovely weekend. So much to tell you I nearly for got to announce the winner of last weeks candy and that lucky person is Emily, please mail me so I can post your price off to you. Have fun with our Birthday celebrations and hope you have a lovely weekend. Good Morning all you crafty Peeps, I've been such a bad blogger the last few days, no new posts, not a great deal of commenting for which I apologise but I've had my head down working on sample for a new venture, well for me it is anyhow. But I do so appreciate all your kind visits despite my absence. Lots of you know our lovely Jo from C&C and her shop Lets Create, well recently she launched her very own range of stamps so I was thrilled to bits when she asked if I would be able to make her some samples using them. 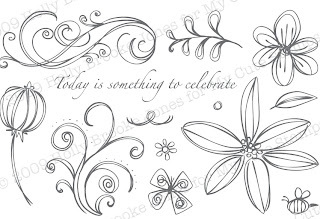 There are six sets each with several stamps on them, a good size and excellent stamping quality. A package is on it's way to Jo a I type with my first batch of samples which she say's she will be using on her stand at the Lincoln Papercraft Show this coming Sunday and fingers crossed a TV channel familiar to lots of us very soon. Meanwhile she has given me the OK to blog a few to give you the heads up to look out for the stamps if you are visiting the show, but if not I think you can order them direct from the shop. You can find a link to her on her blog here. The stamp sets all have a Victorian feel to them but I am finding them very versatile and they will work to either a Vintage or more modern them. The top card uses a floral spray from the Sealed with a Loving Kiss set, coloured with watercolours and glossy accents added. The lovely Victorian shoe on the second card comes from the Victorian Pleasures set, a fairly simple card where the image and Spellbinders does all the talking. 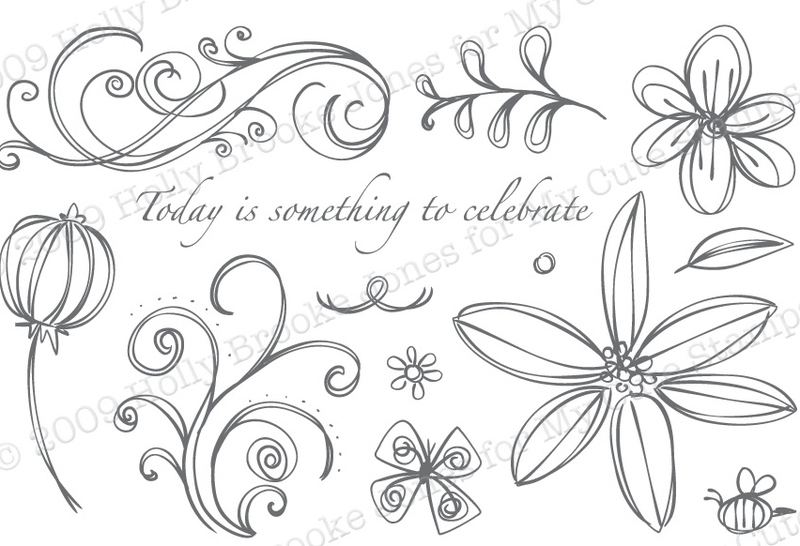 I hope you like Jo's new stamps and can recommend both the quality and versatility. Hopefully I will get a little time to do some blog hopping today. It's Sarah's turn to host the theme at Allsorts and she has chosen the them 'True Blue' and our sponsors this week are Pretty Little Ribbons and FlonzCraft. At the top is a canvas which was a lovely bit of inky indugence, I started by covering the frame with a couple of layers of gesso, then stippling the edges with acrylic pain applied by splodging........another technical term........with a polythene bag to give a lovely textured finish. I coloured the inner of the frame with Pan Pastels and then stamped Hero Arts and Inkylicious poppies which I coloured in with distress markers. For my second piece I have managed to combine products from both of our sponsors, the border stamp is FlonzCraft Baroque corner stamped onto a background created with tea dye and broke chine distress inks and a spritzing of dazzling diamonds glimmer mist. I randomly stamped the centre of the piece with wire and butterfly stamps then added a couple of roses made with blue satin ribbon from Pretty Little Ribbons and swirls using a Cheery Lynn die and spellbinder leaves. The butterfly is also a spellbinder die. Note the new signature at the bottom, isn't it pretty, a very kind blog friend Julie sent it to me, thank you so much Julie. Good Morning Peeps, hope you are all OK. Thanks for all your lovely comment on the photos I shared yesterday and I promise I will as requested share some more as soon as new blossoms burst into life. The May (white thorn) in our hedgerows looks to have an abundance of buds and providing we can avoid more frost and heavy rain it should look beautiful. I have been having yet another clear out in my craft room and have some goodies which I know I will never use so thought I would offer them as candy. The one at the top has stamps and embellishments and the second smaller one a collection of ribbons and embellishments. It will run until 17th June when two winners will be selected and is not connected to my Saturday candy which will continue as usual. 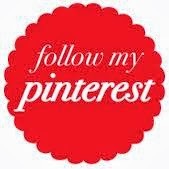 1) Be a follower and not just one who pops along for the candy......I will discount any candy only blogs. 2) Post the main candy picture at top of this post on your own blog sidebar with a link back here. 3) Add you name to the linky below. Morning all, the sun was shining first thing so I took the opportunity to grab a few photos from the gardens, but there are not many to be had still and we are a good month behind now, what a funny season when the daffodils are out with the lilacs. In the orchard it's also a funny season, the pears have now blossomed and in full leaf and there looks to be a reasonable amount of fruit, the plums and gages are just going off and the apples in the early stages of blossoming as you can see.................note one small terrier by the name of Poppy going about her work of keeping things in order.............at least I am sure she thinks she's in charge of everything, a typical terrier really. OK folks, that's my little share for today. Now I need to get my head down and do some office work then later on some magazine work which needs to be on it's way very shortly................a Christmas commission this early would you believe. Hope you all have a good day. Morning Peeps, the sun is shining but will it last ? Yesterday was a real washout, we had it all hail, thunder torrential downpours but no sunshine. A mega quick post here at I have to be at the AHT in Newmarket for 10am with Holly for her follow up appointment to see when they will operate. I am hoping it will be soon as she is a big girl now, at six months old she is almost the size of our grown up labs so her 'little problem' becomes more of as issue, especially at night when one puppy pad is jot not big enough if you follow my drift. So a share of a card I came up with using Stamp Addicts rural stamp sets and Clarity poppies. A simple enough card stamped and inked through an oval mask and a little poppy in the corner created with Tonic Rose stamp and punch set. Most of the colouring is Pan Pastels with a little watercolour pencil to highlight. OK, must rush now and will catch you all later. Good Morning to you all, hope everyone had a good weekend. The weather was a bit iffy here, but at least the wind has dropped and it's not raining at the moment. Just a couple of shares of card using more Tonic Pick of the Bunch punch and stamp sets which I am still loving.........in case you hadn't guessed. The one at the top has an Artistic Outpost sentiment and flowers from the Peruvian Lily set shaded round the edge with Pan Pastels and the DP is Kaiser I think..........it was a paper pad and I've not got the outside cover any more. The little butterfly is from the Pick of the Bunch Fuchsia stamp set, stamped and glittered and the leaves Memory Box. This one uses stamps from several of the stamp sets.............thumbnail links below.......for the background, TH fence and dress form which I decorated with lace and ribbons and the roses are made from vellum using the Punch and Stamp Rose set and again shaded with Pan Pastels. I cut the top of the card with an oval die by taping it in position the laying it with only the part I wanted cut onto the cutting place with the rest sticking out............hope that makes some sort of sense. Have a great week all of you and thanks for popping in and your kind comments. OK, call me sad but this is what came to mind when Wendy chose her theme of 'Any Sport' for this weeks theme at Allsorts challenge. Not having anything to fit the theme in stamps other than a little football, I took an image from a magazine of Stevie and Luis which seemed the obvious choice as the focal element of my card. I make no secret of the fact that I'm a strong Liverpool supporter who dons her club shirt and hat when their matches are on TV and I confess to being more than a little vocal when I am watching...............to such a degree that one of our sons who is also a supporter prefers to watch in a different room to me. So a pretty easy to make card using the football image on the backgound, some strips of red and black DP, a computer generated club anthem and club logo cut from a merchandise label. Also a heads up that we will be having a bit of a celebration in a couple of weeks time as it's our Fourth Brithday...............how that time has flown by. 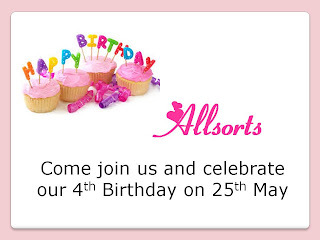 Allsorts was my very first DT and I have been there from the start and now the only remaining member of the original team, but we have a super bunch of girls on the team and we will all be getting together on 25th May for some fun and a Birthday blog hop. Please do grab the logo here and help us spread the word. And of course I need to announce the winner of last weeks candy who is Ellie in USA, well done please mail me with your postal addy. I hope you all have fun with this weeks theme and look forward to visiting your entries. Good Morning Peeps, I hope you are all having a good week. It's somewhat cooler than it was at the weekend but it was lovely to have a few warmer days and spend some time outside. I have a couple of shares of samples I have been making for Stamp Addicts next show on Create and Craft, the date has gone back to 28th May, but the stamps are all available on their web site here under 'what's new'. These stamps have been a joy to work with and I have been indulging in inkiness as well as Pan Pastels which is what I have used on both of these samples. The one above is called 'Hunting Scene Country Gent' and could easily be my Dad, although he never had a spaniel for hunting, always labs. I also used Stamp Addicts Poppy stamps on this one and coloured that and the background with Pan Pastels, then coloured the image with Derwent watercolours. I have some sad news to share as well. 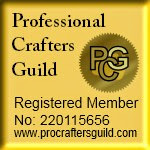 As you will see from the logo here Sarah is closing her Pretty Little Ribbons shop and is having a mega sale of all her stock, you can go check it all out by clicking here as there are loads of bargains to be had. There are lost's more to come which I will be sharing over the next couple of weeks. Have a lovely day everyone and as always many thanks for your visits and kind comments. Good Morning Peeps. 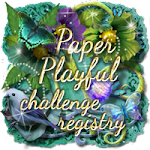 time for some more new monthly challenges and great themes, at Pretty Little Ribbons we would like to see 'Lace' and at FlonzCraft Vintage Stamping Challenges it's 'Lace, Pearls and a touch of Elegance', I can see some perfect opportunities to double up here. My FlonzCraft piece uses a new stamp from their Vintage Fashions Girls range - apparently that's now the 50's and 60's so a bit scary to think that I hail from a Vintage era......C'est la vie! Ayhow, I paper pieced the image using the same DP's as the background which are Teresa Collins and I absolutely love this colour combo. I grounded the image using an Art Impression cobblestone stamp and added a few blossoms at the top with another FlonzCraft stamp. Some lace, pearls swirls and die cut flowers and leaves and finito. And this one is my DT piece for Pretty Little Ribbons using some of Sarah's lovely 16mm Guipure Lace, Pearl Hearts and White Satin Leaf Trim, The image is the gorgeous violet stamp from Stampendous and some new Spellbinders which I just had to have. I made the three violets in the corners using the small leaf punch from the Tonic Punch and Stamp Rose set and the leaves are from Ruth's Pick of the Bunch Lily stamp set which I stamped onto bazzil cardstock which match the leaves on the stamp rather well. I have just one more to share as I had a small piece of the Guipure Lace left so couldn't resist a second card, this one used a Chocolate Baroque bird image and a Stampendous sentiment. The background is distressed with Squeezed Lemons and Shabby Shutters and over stamped using a Penny Black background stamp before stamping the main images with archival coffee. The flowers are also from PLR and I coloured the Satin leaf Trim with green distress ink. Have a good Monday Peeps and hope you will get your lace out and join in our challenges. 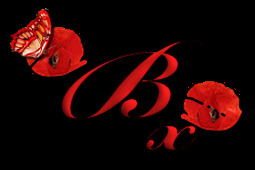 Good Morning Peeps, it's the first Sunday of the month which means time for new challenges at Stamping Sensations where we have the theme 'Embossing and/or texture' and at Penny Black and More it's a bit of a double take 'Sew Special' and can be something for that special person, have some stitching, or even both. For my Penny Black DT piece I have used the gorgeous PB Venetian Summer stamp coloured with watercolours. The backing DP's are My Minds Eye and I made the roses from the same using the Tonic Rose punch and stamp set and the leaves are a Memory Box die which I recently had from Coleman's Craft Warehouse for some sample cards. As Tonic are our sponsors at Stamping Sensations this month I had a real dilemma what products to use as being on Ruth's DT I am lucky enough to own rather a lot of them. I dabbled for a week or so and made a couple of cards that ended up in the bin then I had the germ of an idea in the middle of the night.............as you do when the pain is keeping you awake, but it was productive time as I came up with something I am actually reasonably happy with now it's finished. I bought a couple of shadow boxes at Stamperama which were in the cupboard taking up space, this one is 8x8. I started by coating it with gesso followed by a mixture of gold and beige acrylic paint, just adding it randomly here are there until the gesso was covered, then overstamped both the outer frame and inside aperture with a mixture of background stamps. Next I made three roses from some music score using my Tonic Rose punch and stamp set and whilst they dried stamped some ivy (Chrysanthemum Pick of the Bunch stamp set) butterflies (Rudbeckia stamp set) and large leaves (Lily stamp set) on to brown and ivory bazzil. Once I had cut them all out I dipped all including the roses into UTEE in the melt pot and when cooled arranged them into the frame. Needless to say I had great difficult taking photos as no matter which way I turned the shadow box I go reflection from the glass, but hopefully you can get the general idea. 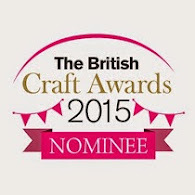 I have another share for Penny Black and More using a FlonzCraft 20's lady image. Lots of background stamping with several Penny Black stamps over Dylusions, the lady was stamped and then bleached out. The sentiment, sadly long since discontinues is Penny Black as is the butterfly and I added some stitching around the sentiment to tie in with the theme. And finally before you all fall asleep on me this really is the last one, another for Stamping Sensations. Just a little pretty fussy creation using Tonic Peruvian Lily stamp and punch set...............if I am honest this set really is my favourite one, some new Spellbinders and Teresa Collins DP, so quick and easy to make but I think rather pretty with those lovely flowers. I am really hoping you will join in our challenges this month, as always we have a fabulous collection of prizes at both and I can see plenty of scope to combine the two challenges if you wish. Enjoy your Sunday and as always thank you so much for your visits and kind comment. Morning Peeps, hope everyone is OK and enjoying this lovely spell of sunshine, fingers crosses it lasts the weekend. I spend a few hours out in it yesterday helping check and secure the fences before the horses are turned out for their first Summer graze and it was lovely to feel the warmth. It's time for a new challenge at Allsorts and Tracy Mouse wants us to 'Add Some Glitter' and everyone who knows her will realise she has a bit of a penchant for a bit of sparkle.................as do most of us if we are honest, so nice choice Tracy. I have used Modern Flower 4 from one of this weeks sponsors DigiStamp Boutique, paper piecing it to match the side pane with Nitwits DP, a little subtle inking with Spun Sugar, a bow and Marianne rose, Cheery Lynn lattice and some liberal glittering of the rose, black liquid pearls and image. I also took a close up of the flower to show what I really did glitter up as it's not too evident on the main picture. I am thinking this theme will be right on song for lots of you and look forward to seeing all your lovely entries. And now for the winner of last weeks candy who is Ali from her comment on Monday's post, please mail me with your full postal addy so I can your goodies in the post to you. Have a lovely weekend everyone, the weather man assures us it's going to be barbie weather so lets hope he's got it right.